Today’s piece of handy information for your Friday! A list of ways you can get your dishwasher smelling and performing much better! Not many people think about how much build up of scum, bacteria and germs can occur. This happens inside the item we trust to get our dishes and cutlery clean enough to eat with. All of the food scraps have to go somewhere, and often don’t make it quite all the way out of your machine. It makes sense to thoroughly clean out the machine you rely on to keep your family healthy. 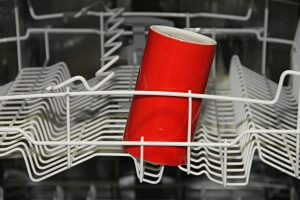 Here are a few tips you can do regularly to freshen up, or deep clean your dishwasher. To freshen up your dishwasher weekly, run a cup of white vinegar instead of detergent on an empty, hot water cycle. This will help get rid of any odours from grime and bacteria build up. Take out the filter and let it soak in warm soapy water for up to 15 minutes. Rinse it out thoroughly and place back into the dishwasher. Regularly remove any build up of sludge or slime that collects in and around the seals of the dishwasher. Do not use too much detergent, it will build up over time and will not make the dishes any cleaner! There is a little circular cup that usually sits in the bottom of the dishwasher. This is called a trap and is there to stop chunks of food or plastic getting in and clogging up your pipes. It is essential to clean this out every time you use the dishwasher. Rotting bits of food sitting around will not help in keeping it smelling fresh. Always use the appropriate cycle for the load of dishes you are washing, and don’t overload it. It is false economy and you’ll probably have to run it again if the cycle was too short or the load was too large. If you live in an area known for hard water, it’s a god idea to run a de-scaler product through your machine every so often to break up scale deposits in your pipes. By taking on these tips, not only will your dishes come out better, your machine’s longevity will be increased. Just like our carpet cleaning Brisbane service, we are also available for any spring cleaning services or advice you require. Contact us now! Awesome. Thanks for sharing this Dishwasher tips.